Dallas-based theatrical and architectural lighting equipment manufacturer Syncrolite LLC is ramping up its management team to accommodate industry growth. Since Dave Keighley joined the company as executive vice president and chief operating officer in January 2013, the company is undergoing new product development, improvement of existing products, a heightened level of service for the concert touring/live event industry, and serious expansion into the architectural/installation and TV/film market. 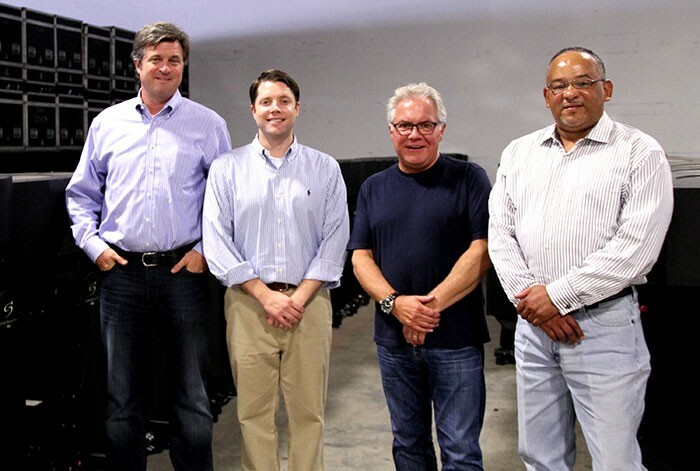 Hall Capital Partners, the new owner of Syncrolite, has brought in veteran industry specialists Jerry Trojan and Steve Washington who were former colleagues at Vari-Lite/VLPS. The new team is joined by Jonathan Adamson, chairman of Syncrolite and a representative of Hall Capital Partners, which is supporting the growth. Jerry Trojan joined Syncrolite full-time in June as chief financial officer and executive vice president of corporate strategy. Prior to this, he served as Syncrolite’s contract CFO and provided financial consulting services to the company since August 2004. Prior to joining Syncrolite, Trojan had served as the CFO for several public and private commercial companies outside the industry including two consumer retail businesses Pizza Inn Inc. and Palm Beach Tan Inc., and Moll Industries Inc., a custom plastics injection molded/manufacturer. Before Moll, Trojan worked at VLPS Lighting Services International Inc. (formerly known as Vari-Lite International Inc. and Showco Inc.), beginning in May 1995, ultimately serving as vice president of finance and CFO until the sale of the company to Production Resource Group (PRG) in 2004. He is a certified public accountant and has an MBA and a BBA. Steve Washington joined Syncrolite as an operations consultant in January 2013 after the acquisition by Hall Capital Partners. He took on a full-time role in May as vice president of operations. After his career start as a licensed master electrician in New Orleans, Washington soon moved to Dallas as a quality engineer for Vari-Lite in the 1990s. He moved into management roles as the company changed names through acquisitions to VLPS Corporate, then PRG in 2004. As General Manager and part of PRG’s management team, Washington supported the company’s growth cycle which quickly hurdled to more than 35 worldwide offices. After departing PRG in 2011, Washington opened a consulting firm where he supported the efforts of Production & Rigging Resources, Wybron Inc. and Creative Stage Lighting. "You talk about getting the band together!," says Washington, referring to his former and now current colleagues. "Joining the team is exciting in every way imaginable. Working with Hall Capital Partners, Dave, Jerry, Jimmy Page, Jacqui LaFleur and the invaluable tenured Syncrolite staff will bring the company forward in a big way. Our industry will be extremely pleased with Syncrolite’s direction in coming years. He adds: "Our message will be to continue providing the brightest lights for the industry’s biggest nights but will include a fresh breath of technology and new development to the product line. Syncrolite will differentiate itself from other manufacturers through superlative service, a robust product line and a committed dedication to providing affordable solutions." Syncrolite’s large-format lighting products have been specified on prestigious projects including the 2012 London Olympics and more recent music events such as Coachella and the upcoming Austin City Limits Music Festival. In picture: Syncrolite LLC’s Jonathan Adamson, Jerry Trojan, David Keighley and Steve Washington.